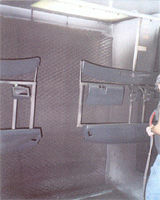 Paint Pockets Green is your best value for production spray booths. Paint Pockets Green is specially engineered to filter both liquid and powder coating overspray generated in industrial and automotive applications. This filter is specifically designed and priced to replace expanded paper, fiberglass and other lower efficient lower cost filters. By switching your filtration media to Paint Pockets Green you reap the rewards of the Paint Pockets Green triple bonus. 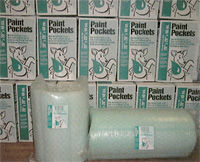 Paint Pockets Green's 99.43% arrestance efficiency means it knocks down and retains more overspray than other filters. It keeps overspray out of your exhaust stack and off the booth floor. The Paint Pockets Green filter has a holding capacity of up to 6 pounds of overspray per square foot. Filters loaded with overspray do get heavy, but won't tear or sag due to the special design of the filter. Its unique design holds up to five times more overspray than other filters, enabling you to cut your filter changes by up to 80%. The three-dimensional "diamond pocket" embedded in the front face of Paint Pockets Green more than double its surface area allowing the filter to remain in the booth longer to capture and hold large quantities of overspray. As the filter loads with overspray they start to resemble your current filter but do not need to be changed until the sides of the pocket fill with overspray. Using Paint Pockets Green filters will save you money. You can slash disposal costs due to the extended life of the filter. Fewer filter changes means less waste. Your savings are significant, particularly if you use hazardous waste processors. 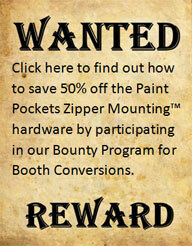 Paint Pockets Green filters help you to lower the total costs associated in operating your spray booth. When you change filters less frequently you lower the labor and overhead costs associated in running your booth. By eliminating frequent filter changes you increase the number of hours your spray booth can be in operation thus increasing your productivity. PPG-030-060-001 30" x 60' Blanket 1 / Pkg. PPG-036-060-001 36" x 60' Blanket 1 / Pkg. PPG-048-060-001 48" x 60' Blanket 1 / Pkg. PPG-060-060-001 60" x 60' Blanket 1 / Pkg. Special sizes are available when ordered in sufficient quantities. Contact us for more information. Paint Arrestance Filter Test results are in.